Our Most Versatile Lamp Ever! 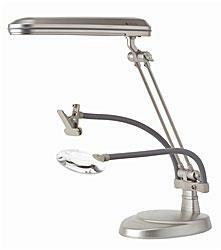 The OttLite 3-in-1 Craft Lamp is designed for ultimate functionality with a bonus magnifier and pattern clip. 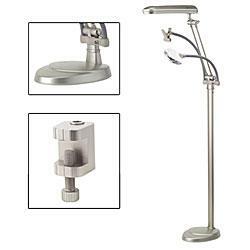 Designer’s choice – use as a floor lamp, sturdy clamp-on lamp or a table lamp. 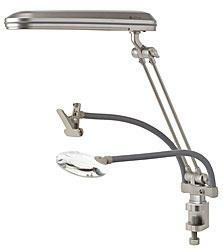 Lamp easily converts with included hardware to meet the needs of your work space. Flexible gooseneck attachment with sturdy clip securely holds pictures, patterns, charts, instructions and more – it’s like having an extra hand. Up to 5x optical grade magnifier features easily adjustable flexible gooseneck for hands free viewing.